Everyone in Arkansas has spent at least one-weekend swimming and boating at a lake. The state has so many pristine lakes, why wouldn't you? Many of them offer free (or really cheap) swimming alongside fishing, hiking, and just enjoying Arkansas. Everyone in Arkansas probably has memories of Lake Ouachita. Swimming, boating, camping, hiking, biking, and any other outdoor recreation you can think of can be done at Lake Ouachita. 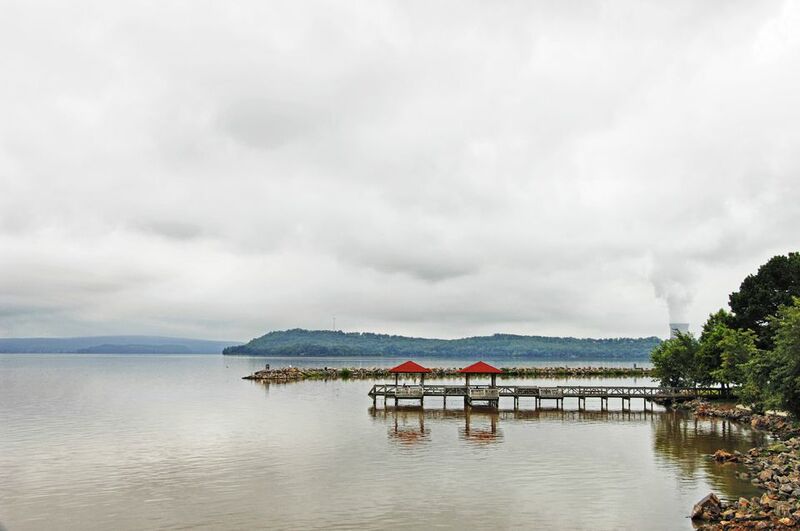 This 40,000-acre lake has more 200 islands, limited shore development and 975 miles of shoreline surrounded by the Ouachita National Forest. It's the largest lake located entirely within Arkansas, It's also one of the cleanest lakes in the US, and is considered a "Diamond Lake." Underwater visibility in Lake Ouachita can range from 6 to 30 feet. There are 10 buoyed off designated swimming beaches around Lake Ouachita. They also have five playground areas. Lake Ouachita is located near Hot Springs, about two hours from Little Rock. Other great lakes to swim in the Ouachita National forests are Shady Lake and Lake Hinkle. They are much smaller than Lake Ouachita (but further away from Little Rock). Greers Ferry is another popular lake and is also one of the cleanest lakes in the nation. It has over 31,000 acres of water and 276 miles of scenic shoreline. One of the most popular of the beaches at Greer's Ferry Lake is "Sandy Beach." It has real sand is the home to the annual Cardboard Boat Races. Another popular site is Dam Site park which has fun rock structures for kids to jump off of. Greers Ferry is located near Heber Springs, about an hour and a half from Little Rock. There are vehicle fees to use some parts of Greers Ferry. Lake Sylvia is only 18 acres, but it's a great place to swim and not too far from Little Rock. It is in the foothills of the Ouachita Mountains, so it has great scenery and a nice little dock. You can also fish, hike and camp there. It's located in Perryville, Arkansas, about an hour from Little Rock. There is a per car fee. Beaverfork Lake is a medium-sized lake with 960 acres of water. It's located in Conway, so it's super close to Little Rock. You can hike, fish, windsurf and more. It's also where you'll find Conway's largest city park. It's located on the west end of the lake and you'll find swimming, concessions, picnic areas and a playground. Located in Conway, less than an hour from Little Rock. Lake Bennet in Woolly Hollow state park is just about 40-acres, but offers a swim beach, paddle-boats and kayaks. You can also fish and hike around the state park. Located just north of Conway (near Greenbrier), this one of the only beaches in Arkansas that has lifeguards (sometimes). Because of this and all the other amenities, there's a fee for swimming. Located in Greenbrier about an hour from Little Rock. Lake Catherine is one of five diamond lakes in Hot Springs, so called because of their pristine water. It is 1,940 acres and has one swimming area with a nice sand beach. The visitor's center overlooks the swimming area. Other areas of the lake can be used for fishing, boating, and the park has stables with horses. It's located close to Hot Springs National Park, at the base of the Ouachita Mountains. Lake Catherine is in Hot Springs, about an hour from Little Rock. Another of the Hot Springs Diamond Lakes is Lake Hamilton. Lake Hamilton is 7,200 acres with 198 miles of shoreline littered with shops, homes, and resorts. There are three islands in Lake Hamilton. You can fish, boat and hike here and you can even boat to Garvan Gardens. Some swimming areas are free and some are privately owned. Lake Hamilton is located in Hot Springs, about an hour from Little Rock. Lake Dardanelle is 34,300 acres with the visitor's center being located in Russellville, AR and another site in Dardanelle. The swim beach is on the Russellville side. The visitor's center in Russellville has aquariums, a honey bee hive and lots of interactive exhibits. You can also hike, fish and picnic here. Located in Russellville, about an hour and a half from Little Rock. Lake Nimrod is 3,550 acres with 77 miles of shoreline on Arkansas Scenic 7 Byway. It was created by the Corps of Engineers and is the oldest Corps of Engineers project in Arkansas. Lake Nimrod is known for fishing, but it's also perfect for boating, hiking, and camping. There are swimming areas and playgrounds scattered all over. Swimming areas are located in Quarry Cove, Carden Point, and Carter Cove Parks. Day use fees are charged for the use of the swim beaches. Lake Nimrod is located in Yell County, about an hour and a half from Little Rock. If lakes aren't your speed, check out Arkansas pools and water parks.